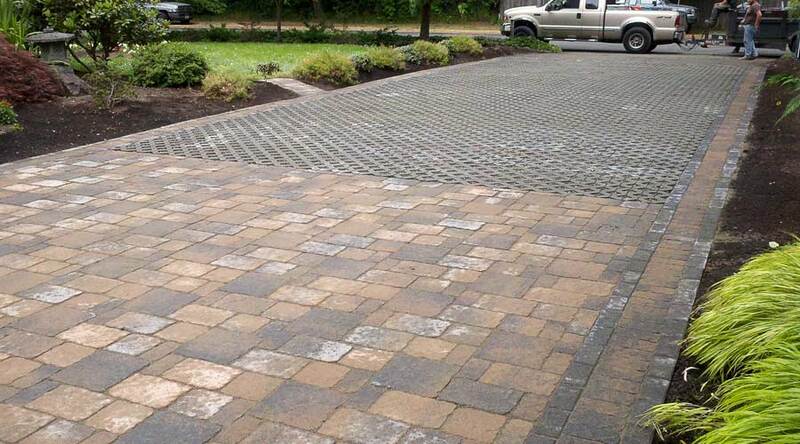 Paver driveway after construction. The lattice pattern creates depth and dimension. 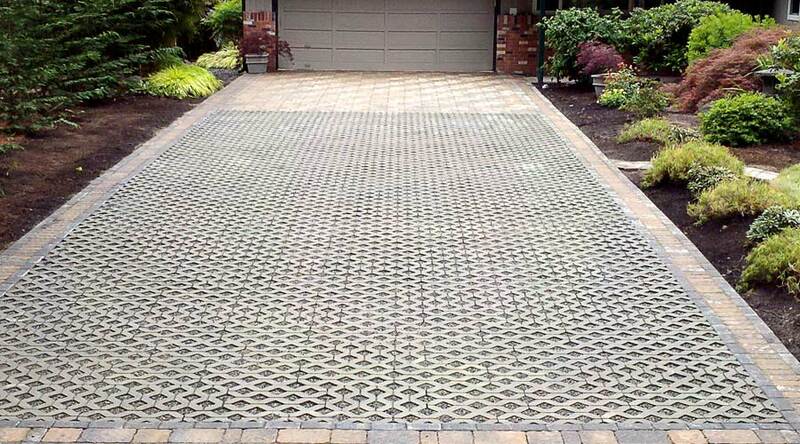 Using permeable pavers filters and drains the water away from the driveway, eliminating puddles and sinkholes. Another view of the finished paver driveway. 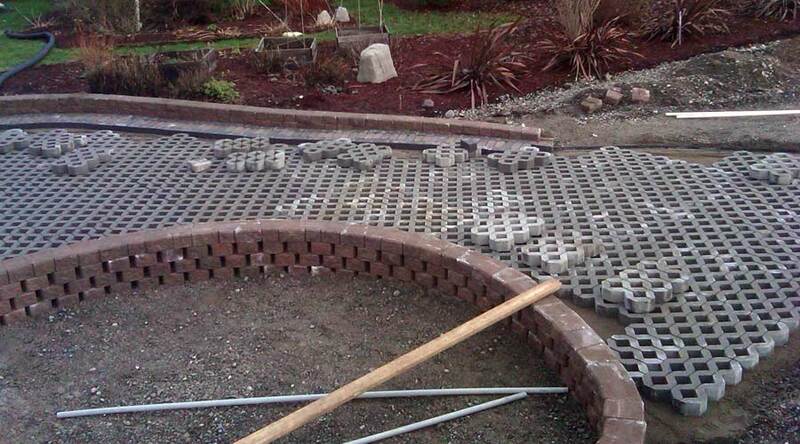 For additional character, grass will be planted between the permeable pavers. Another view of the original driveway. The concrete slab, as well as the unfinished gravel driveway will be replaced with eco-friendly, permeable pavers. 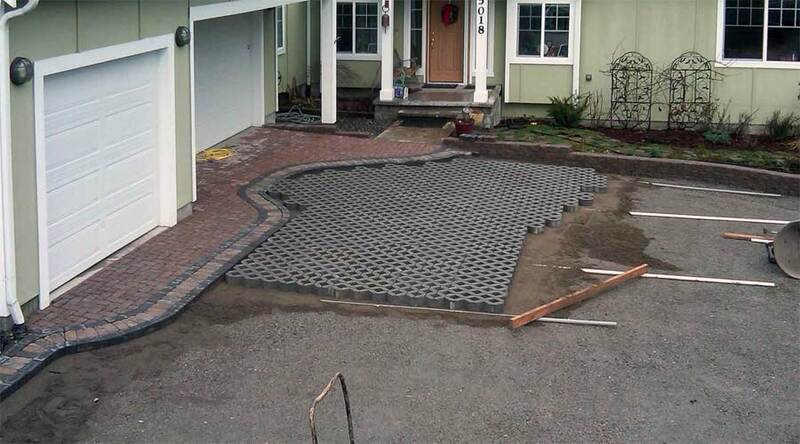 To prepare the driveway, the gravel base will be compacted to 8" and then the pavers will be installed on top. Original driveway before construction. 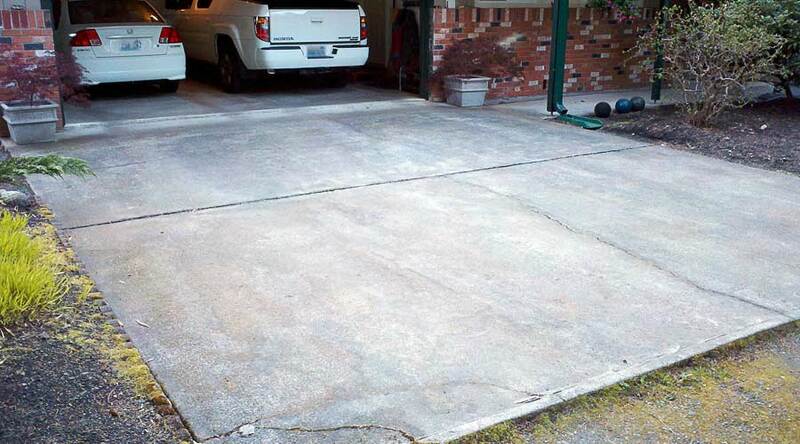 This old, weathered concrete slab will be removed and replaced with a large, permeable paver driveway. The completed permeable turf stone driveway. The turf stone has been seeded with grass. 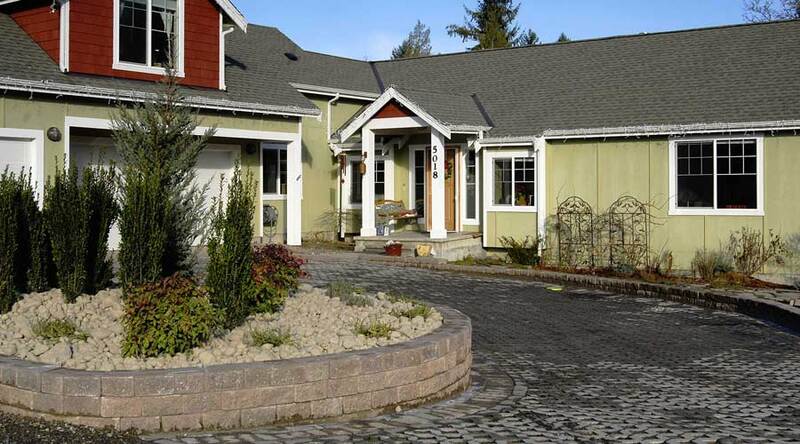 Once the grass has matured, the driveway can be mowed just like the rest of the lawn around the home. Before construction. 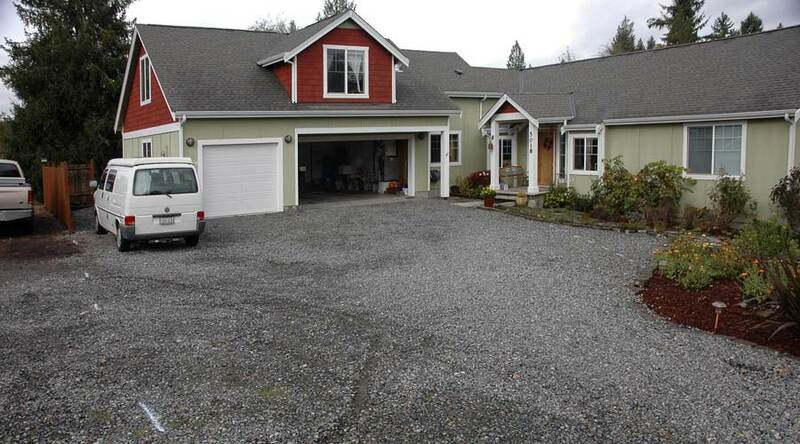 The original driveway was simple, unfinished gravel. We will replace this with permeable turf stone and a central planting area to add character and prestige to this beautiful home. We have installed a paver walkway connecting the entrance to the garage. Installed at a slight grade, this will channel water away from the house to the permeable turf stone. 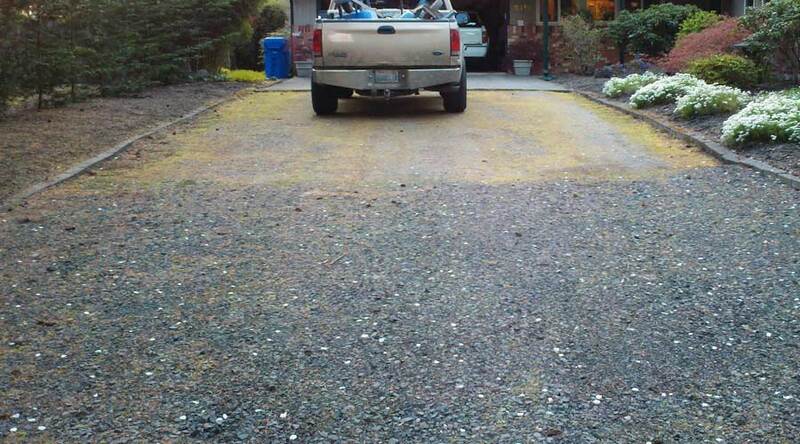 For proper installation, underneath the turf stone is a compacted layer of gravel covered with a layer of sand. Another view of the permeable turf stone being installed. 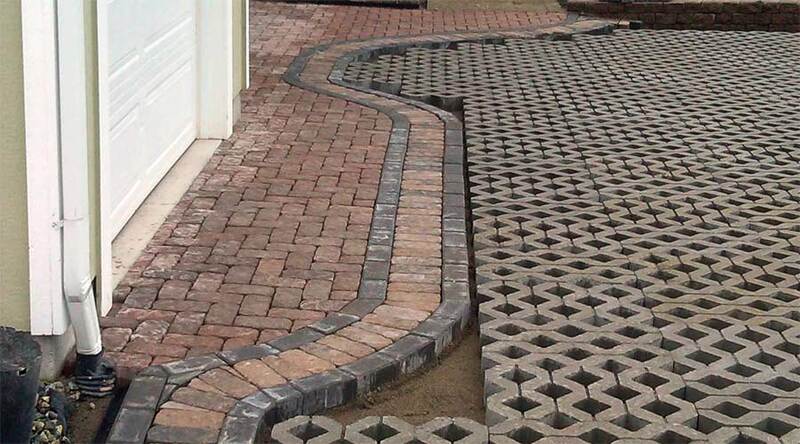 Note the transition achieved by using different styles of pavers. This will add dimension and a more finished look to the final project. Construction of circular planting area in the middle of the driveway. This transforms the area into a circular drive and will complement the existing softscape.